When I received the assignment to share five reasons to switch to AMSOIL, I did something different: I was curious to hear what others at AMSOIL would say, so I decided to crowdsource it, sending an email to several people on our staff to pick their brains a bit. Until 2005, the word “crowdsourcing” didn’t really exist. The word was invented to define a new sourcing model that had sprung up on the Internet, combining the words crowd and sourcing. The concept is quite familiar today due to crowdfunding sites like Kickstarter. Wikipedia is also a variation on the concept, a super-encyclopedia created by a global crowd of contributors. One reason I wanted to ask AMSOIL employees was due to my curiosity about what they would say. After you read their responses, I will share how I came to make AMSOIL my motor oil of choice back in the 1980s. Peace-of-mind protection (the extra performance is a great, cheap insurance policy). Convenience of extended drains (it’s ok to delay my normal spring/fall change by a few weeks if I’m busy). Great cold-temperature performance – smoother shifts, dependable starts and better fuel economy on cold days! Quality – AMSOIL pays great attention to the quality of its products, down to the very last detail. Performance – Whether you desire the performance we’ve built into the products, we have truly engineered the best products for the applications. We’ve cranked up every dial in performance we can to ensure your application gets the best of what it needs. Understanding – AMSOIL puts so much thought into your equipment and provides a product that truly has the capability of improving performance, reliability and longevity. High-performance products – AMSOIL is one of the best products available, meaning your vehicles and equipment receive outstanding protection. Trustworthy – AMSOIL backs up its product claims with test results. Save money – Extended drain intervals and long-lasting equipment save you money. It really is the best protection for my car on the market. The company is very environmentally conscious. Even though I change my oil every 10,ooo miles, I like that I could push it further if I can’t get in to get an appointment. It would still be fine and not hurt anything to push it out a bit longer. When I came to Minnesota in the 1970s, my first winter here was something of a culture shock. If I remember correctly, Minneapolis experienced a cold snap of such ferocity and duration that it never got above zero for 54 days, and for 10 days straight the mercury seemed stuck at -30ºF. I’d never lived in a place where people plug in their cars to keep the engines warm. 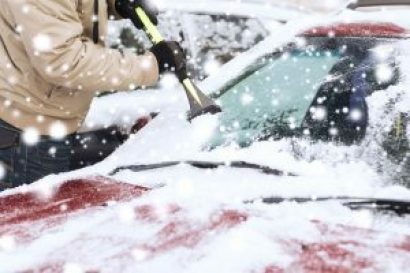 At the time I didn’t own a car because I was in school, but when I returned to Minnesota in 1982 it became apparent that I needed to address this matter of cold-winter starts. My brother-in-law, who grew up in that Zenith-City-icebox known as Duluth, Minn., told me about a motor oil that stayed fluid down to -70ºF. He shared how, when you start your car, conventional oil remains in a semi-solid state in the oil pan and that it’s the heat generated by friction that warms the engine to get the oil flowing to critical engine parts. My car would start easier and have better engine protection with AMSOIL synthetic motor oil. He also told me about film strength in a way I’d never heard it before, and simply understanding this concept pretty much settled it for me. I experienced some sticker-shock on the price, but learned that you didn’t have to change your oil as often, so the higher initial price was offset by reduced annual life-cycle cost. That is, when you compare what you spend on oil per year, instead of per oil change, I was ahead of the game with AMSOIL. Furthermore, my engine was far ahead of the game in terms of cleanliness and protection. Times have changed in many respects. Today’s cars have engines that put far greater demands on lubricants. As a result, conventional motor oil needed to improve, and as a result you can’t buy it for a pittance any more – and receive a mail-in rebate to boot. The more you understand what goes on inside your engine, especially with turbochargers, variable valve timing and other sophisticated components, the less you’ll be inclined to choose oil based solely on price. When all is said and done, I choose AMSOIL for its excellent cold-temperature performance, wear protection and performance.